Benj Pasek and Justin Paul arrive at the 90th Academy Awards on Sunday, March 4, 2018, at the Dolby Theatre at Hollywood & Highland Center in Hollywood. 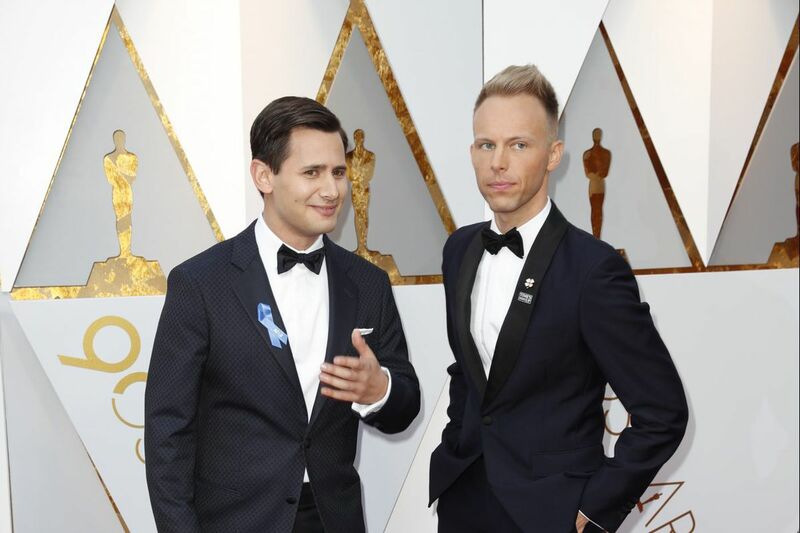 The Academy Awards snubbed Ardmore native Benj Pasek and his writing partner Justin Paul tonight, passing over the pair's "This Is Me" from The Greatest Showman for best original song in favor of Kristen Anderson-Lopez and Robert Lopez's "Remember Me" from Coco. A win for Pasek and Paul this year would have given them back-to-back Oscars in the Best Original Song category and made them the third songwriters in history to get consecutive wins in the category. The pair previously won last year for "City of Stars" from La La Land. That hasn't happened in the category since 1992, when Alan Menken and Tim Rice took home best original song for "A Whole New World" from Aladdin, having won the same award for "Beauty and the Beast" from Beauty and the Beast the year before. The two songwriters, however, are already back-to-back best original song winners at the Golden Globes, which honored "This Is Me" this year. The pair won a best song Golden Globe for "City of Stars" from La La Land last year. Currently, Pasek and Paul are just an "E" away from an EGOT, a coveted collection of Emmy, Grammy, Oscar, and Tony awards. Only a dozen people, such as Audrey Hepburn, Mel Brooks, and Whoopi Goldberg, have accomplished that feat. The pair won a Tony for best original score last year and a Grammy in January for best musical theater album for their work on Dear Evan Hansen. This year's winners, Anderson-Lopez and Lopez, previously won in 2013 for Frozen's "Let It Go."